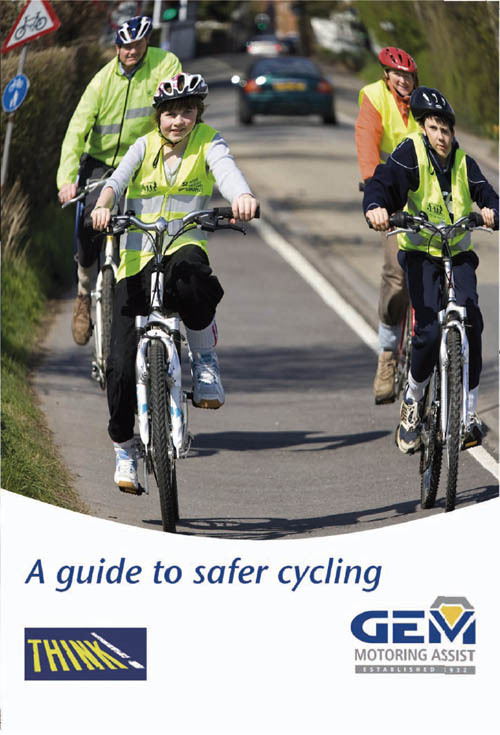 An email from the Environmental Transport Association today announces news of the latest campaign to force everyone under 14 to wear a cycle helmet. The call for compulsory legislation comes from the Bicycle Helmet Initiative Trust, a charity that promotes helmet use amongst children. Their latest campaign will shortly be hitting every school in England, Wales and Northern Ireland, in the form of teachers’ packs and DVDs. But there are a few catches. Despite widespread evidence showing that head injuries amongst children occur in a wide range of circumstances, and particularly whilst in a car, this campaign is targeted at under 14’s only when they are on a bicycle. Second, the campaign is being funded by GEM, the motoring organisation. What would a motoring organisation be doing funding a campaign that wants to see cycle helmets compulsory for under 14 year old cyclists? 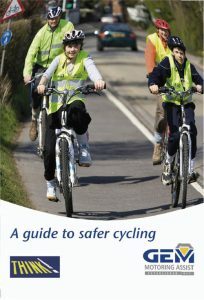 But perhaps most remarkable of all, GEM themselves have produced a “guide to safer cycling” featuring a child on a bike with a disconnected front brake. This potent brew of motoring interests, cycle helmet compulsion and dodgy brakes has provoked a stream of critical comments on the GEM blog. Have a look for yourself. Interestingly, whilst I’ve been writing this, GEM have pulled the link to the document in question. The sad thing is, this is precisely the sort of “advice” that reaches our decision makers via well-paid lobbyists, whilst the real knowledge that is out there about cycling safety, and has been regularly featured on this blog, gets routinely ignored. Perhaps the last word should go to our great friend and film-maker Mike Rubbo, who made this short film a while ago about an Australian cyclist who refuses to obey the compulsory helmet law down there. I have to relate cycle helmet use to my experience of riding motorcycles for a fair few number of years. I’ve been “unintentionally removed” from my bikes several times, the last occasion when stationary. A side swipe, my speed at impact zero, and – thankfully – the car that hit me was travelling at about 5mph. Battered and bruised I picked myself up, removed my bone dome and swore rather a lot. Once you’ve had an impact on a helmet, it becomes useless and should be binned and this I did with mine. But before I chucked it, I have to say there was a rather deep gouge at the top. If I had been ejected from my saddle without the helmet that gouge would have been in my skull. What lessons have I learned? Firstly, even low speed impact can damage my already frail brain box. Secondly, if riding in mixed traffic on two wheels I will ALWAYS come of worse every time should someone else, or me, make a mistake. Thirdly, play the odds of injury and try to reduce them in your favour, stick a bone dome on when riding on busy roads – PLEASE – and I don’t care who or what organisation promotes this, if it gets youngsters to wear a bone dome, that in my book is great news. If the U.K. ever becomes like the Netherlands, then fine, chuck them. As to helmet use being made compulsory, a big fat no as one of the pleasure of riding a cycle is the freedom it grants, and as the video shows, no need on quite paths or places where cyclists are in the majority and vehicles in the minority, the odds here of injury have been considerably reduced. The video shows the Australian town from whence the lady objector cycles with nice, quite, wide streets, but occasionally shows other busy locations where not wearing a helmet would be, for want of a better word, rather stupid. As an advocate for "Disabled Sport" during 14 seasons of riding the bike in Europe i have hit the deck both at speed and slowly with the helmet getting a lot of damage on occasions . Here in Austria this year Cycling Helmets have become compulsory for school children following on from an earlier requirement for them to be worn on the snowfields . Careless Advertising does not detract from the fact that a young life will be damaged IF head hits ground . Spending money on a bike does not always result in it being used safely and the user having safe and carefree journeys . Who amongst you would drive under the influence of Alcohol or fail to pay their insurances knowing there was a certainty of losing money when apprehended ?